Okay, I don’t hate the GMAT, but maybe you do. Fair enough. The GMAT is a divisive test (and I’m not talking about how it divides everyone into percentiles). I’m talking about how people love it and hate it. The passion is intense and the hatred is incinerating. Tasked with approaching these “haters,” my first inclination was to disabuse them of their negativity and preach the wisdom of positive thoughts. Until I read an article about the benefits of negative thinking. One particular technique, credited to the Stoic philosophers of Greece, stood out as counterintuitive and intriguing, and something that we might be able to use for “GMAT haters.” “…Sometimes the best way to address an uncertain future is to focus not on the best-case scenario but on the worst…Just thinking in sober detail about worst-case scenarios—a technique the Stoics called ‘the premeditation of evils’—can help to sap the future of its anxiety-producing power.” And that is exactly what we will do. 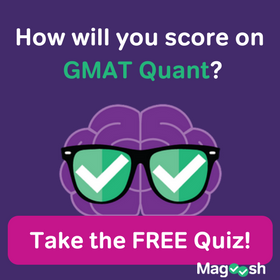 Let’s go through all the reasons you might find the GMAT infuriating and meditate on these evils in the hopes of usurping their anxiety-causing power. And if that doesn’t work, at least you’ll have a chance to vent before you get back to studying. You’re right! This test is expensive. It’s one of the most expensive standardized tests, even the ones for law school and med school are cheaper. And you know, if you don’t optimize your studies, you’ll end up taking the test a second time, maybe even a third time. Who knows, you might take it eight times like this person. Now we are talking about spending thousands of dollars before you even get into a school. This brings up a good point—business school expenses. The cost of the test might not be enough to cover the cost of books for your first semester. You are worried about $250 when you are going to probably quit work and go to school full time for at least two years. Wharton grads leave with an MBA and a debt just over $100,000. Harvard and Stanford is better, but not by much. These students still owe around $75,000. 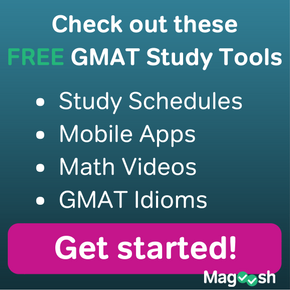 Still upset about the cost of the GMAT? Who knew that a test would cause so much anxiety and stress. Many of you need a high score to balance your application. Others of you think a high score will guarantee you a seat at one of the top business schools. You are competing with people from around the world. Many of them are smarter than you, have better references, have more experience, and have better grades from undergraduate school. The pressure builds further and further. And even if you do get into an MBA program, it doesn’t end there. You still need to find a job, probably in a highly competitive market. Who knows how long you won’t have a job before graduation. Maybe you’ll be lucky and find a job right out of school. But I’m sure you won’t have your feet kicked up and ice tea at hand. No, you’ll be working constantly. Your boss will demand things of you that are entirely unreasonable, and the employees you manage will revolt or undermine your plans. And this is just your professional life. We haven’t even started with your personal life. 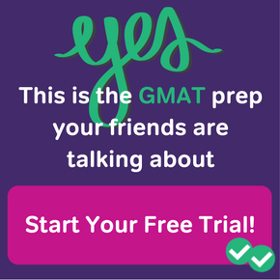 Still upset about the pressure of taking the GMAT? Alright! Stop! That’s all the negative thinking and hating I can stand! The Stoics may have thought this a useful tactic, but it is really depressing. What do they know anyway? The social pressures and anxiety of Athens in 3rd century BCE are not the same as ours today. We need tactics from this common era to deal with the stresses of this era. So you are right that the minutiae of the test is not going to be useful every day in business. But you will definitely need critical thinking, reading comprehension, and mathematical reasoning to run a company or lead a team through the murky waters of business development, growth, marketing, and strategy. Don’t be myopic! It’s not the specific math facts that are important; it’s the ability to reason through a problem, to troubleshoot and make decisions based on limited information. These are skills you will need for success in school and business. Stop right there! No more negative thinking, remember? We finished that. We’ve pivoted to more positive thoughts. You are upset about something that the GMAT is not. It’s like being upset with the plummer for not fixing an electrical outage. It’s not within her purview. The GMAT is only looking at a very narrow field of skill—math, reading, writing, critical thinking—and it is not even a true measure of those skills. Rather its a ruler that each school uses to measure an applicant to their school. It’s not the only ruler they use, just one of the rulers. And it is the only ruler that is the same for every applicant. That is, no other part of the application allows schools to look at two students with the same filter. Undergraduate grades, letters of recommendation, and statements of purpose are all subjective and unique, and ultimately not very useful for side by side comparisons. But the GMAT is perfect for this. So don’t demand a perfect assessment of skills when all the test does is measure an aspect of your skill so that business schools have a way of comparing candidates side-by-side. You now have two options—the meditation on evils or the pivot to positive thinking. Ultimately, none of this will help you significantly on test day. Hate or love, if you want to reach your goal, you have to start studying. Don’t let hate of the test become loathing of thy self. Happy studying!